You may have noticed in the past few years, there has been an increase in the popularity of Zombie’s and the subsequent apocalyptic disaster than generally ensues. The Zombie folklore began increasing in popularity in the 1970’s and then dramatically increased in popularity again in the late 1990’s through present day, as exhibited in an examination of the word “Zombie” in English literature (see Fig. 1) as illustrated by a Google NGram data analysis. So the question I ask, is why? Why have Zombies dramatically increased in popularity? What is it about Zombies that creates such a following? In order to properly explicate the rise in popularity of the Zombie folklore we should unpack the question: what is a zombie? In this examination instead of focusing directly on Zombies explicitly we can delve into the shades of grey and look at the threshold of when a subject becomes perceivable as showcasing Zombie characteristics. Or, in other words, when does an entity go from non-zombie to zombie? This threshold can be explored when we examine the expansion in human animation and robotic human replica technology. In 2013 the Discovery Channels Youtube channel D News published a short video titled Why Human Replica’s Creep Us Out, which discussed how we perceive robots and computer generated animation when it begins to get very close to replicating actual humans. The video references the conceptual and theoretical work of robotics professor Masahiro Mori who advanced the ontic-ontolgoical problem of advanced robotics/animation, which was later referred to as the uncanny valley by Jasia Reichardt in the 1978 book Robots: Fact, Fiction and Prediction. Which was an expansion on the essay Das Unheimliche (the uncanny) published by Sigmund Freud in 1919, where Freud argues that our experiencing subjectivity will rationalize the rejection of overtly familiar entities as a result of cognitive dissonance; as we work hard to rationalize between what is both familiar and unfamiliar in the same instance and we take the path of least resistance and reject the entity altogether. Mori illustrated this idea in a chart that he published (See Fig. 2) that illustrates that in both still (photograph) and moving (animation) media there is a rise in familiarity as the entity approaches 50% human likeness, but around 80% likeness there is a drop-off effect (uncanny valley) where the still image will resemble a corpse and the moving will resemble a zombie. Lacan’s idea of the symbolic register is the place where human subjects communicate, the register of language and this is the heart of subjectivity. A human replicate may look like a human, but the one thing that they will always be lacking is subjectivity– or, rather, the essence or spark of life that makes humans human. This leads to us perceiving the human replicas’s as being a cast away from the realm of humanness– where they are the “me that is not me” (Kristeva, 5) and have been permanently moved into the imaginary registry in a “cast away” state of being’, in what Kristeva called abjection (Beardsworth, 189-192). That is to say we innately recognize that they are lacking subjectivity and as we recognize the physically familiar in congruence with the metaphysical unfamiliar we (as Freud argues) reject the familiar as being the easier of the two choices. As opposed to the much more difficult task of restructuring our schema of what a human is? If a Zombie in Lacan pyschoanalytic theory represents an abjection, or a human-like subject that has lost its subjectivity, then that is to say that in the last forty years we have become obsessed with a folklore that represents a loss of human subjectivity, a loss of essence or, in theological terms, a loss of a soul. And in all Zombie media we do not willingly join the Zombie population, but in fact, we resist the urge to lose ourselves in the abyss of being reduced to a mere object without subject, a sub-human species that crawls around from mere reptilian brain impulses. The Marxist interpretation of this Zombie obsession would contest to argue that the attraction to Zombie mythology is because of a deep-seated fear of becoming objectified by post-industrial society– becoming a cog in the wheel of industry and losing ourselves in the chasm of the capitalist machinery. But beyond being objectified by industry and wage labor the postmodern human objectifies themselves further in many other components of life, as we pervasively find new ways to expand the semblance of productivity in exchange for a decline in interpersonal contact. I can purchase almost anything and have it delivered to my door without having to see or talk to anybody. I can socialize virtually through the objectified cyber-persona I project into the world. I curate my photos and thoughts to create the idea of the person I want to be perceived as. We have all become works of art, a performance, our lives are an installation that we build and craft in spite of our essence and subjectivity. We may not consciously perceive this or accept this, but we may feel it. We may feel our true self being torn away chunk by chunk by global capitalism, social media and the internet-of-things that wants to convert us to perpetual and all encompassed internet datum to be bought and sold on robot driven markets. But we know it is not a total loss of self, as we can retract from reality into our respective places of comfort and find temporary and synthetic individuation. And it is the fear of the total loss, the fear of modernity, the fear that we will be eaten alive by a sea of objectifying, soulless, mindless zombies that want to fully consume both our essence and subjectivity and leave us as an empty shell of existence that is no longer recognizable as a human subject. That is not to say that zombies go around with a premeditated objective to steal our souls; or whomever created the Zombie mythology set-out to create social commentary. Art reflects life in the same dialectical instance that life reflects art and regardless of motivation, all human projects will always contain the impression of the human condition. We cannot create without becoming infused within our creation. The zombie does not create, nor does the zombie have a human condition— the zombie only follows the impulse of their short and decisive script: eat. The reason, I posit, why Zombie mythology has become popular is because we unconsciously fear modernity, we fear being stripped from the thing that makes us human– our essence of self. We fear being eaten alive by capitalism or, perhaps, we fear that we will eventually turn our self into a commodity that can be sucked through the wires of the internet — fragmented into digital impulses. Consumed. Objectified. Destroyed. If a Zombie apocalypse were to become actual, it would never be evident; as the zombie we all fear lives within us and the apocalypse will arise when we all eat and consume ourselves. The “uncanny of all guests” (Nietzsche, 1967) lives within. Discovery Channel, D News, “Why Human Replicas Creep Us Out” 2013. Web. Freud, Sigmund, and David McLintock. The Uncanny. New York: Penguin, 2003. Print. Kawaguchi, Judit (10 March 2011). “Robocon founder Dr. Masahiro Mori”. Words To Live By. Japan Times. p. 11. Lacan, Jacques. Ecrits. Paris: Editions Du Seuil, 1966. Print. Reichardt, Jasia. 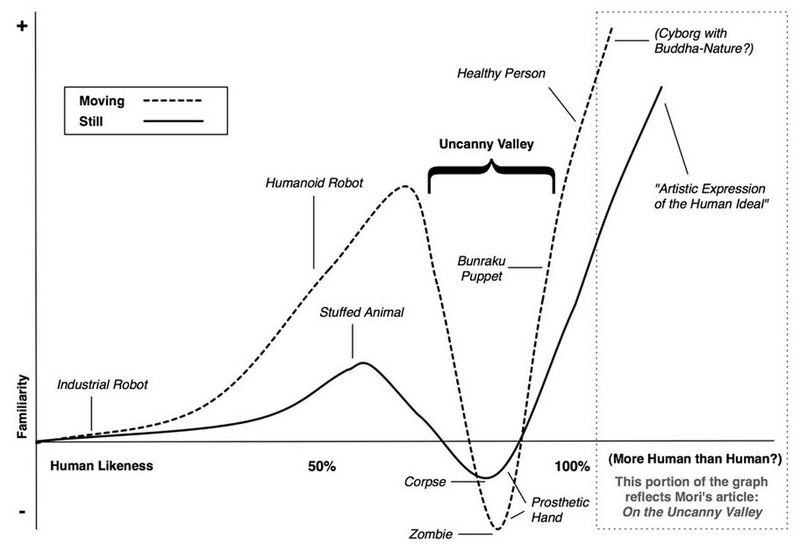 Robots: Fact, Fiction, and Prediction. New York: Viking, 1978. Print.